We love easy meals that taste like they came off a trendy SoHo bistro menu. And a sandwich that takes two minutes to assemble is a fantastic option for picnics, pool parties, and impromptu lunch work-dates. Start with a light bread, preferably herbed or flavored. I love this rectangular focaccia made by a local bakery. If you’re looking to assemble in a hurry, make sure to pick something already sliced! Mustard varies by personal taste, but we like a stone ground, medium flavor style. Something with a good flavor that won’t take control of the sandwich. As for pesto, those little good-quality jars in the gourmet or health food sections are guilty little pleasures. After all, fresh is best, but who has the time or resources often? Slather opposite sides of your sammie with the mustard and the pesto. Then apply a layer of your preferred cheese. We use Muenster, provolone, or swiss because it’s fairly easy to find pre-sliced and good quality. We settled on Boar’s Head Muenster last time and it was perfect. 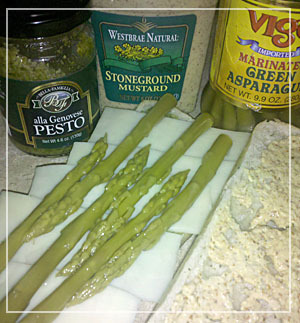 Before you seal up your sammie, slide in a few stalks of marinated asparagus for texture and flavor. Look for the right kind of jarred asparagus though because it can be very bad if you go the cheap route. Look at the heads to make sure they’re still intact so you don’t end up with mushy asparagus slugs. Suggested accompaniments: blue corn chips, black bean humus, and dry cider or real ginger ale.